The story behind the name: Starting at the foot of Orion, the constellation Eridanaus (a river), winds it way southward to its brightest star, Achernar. Eridanus has been associated with rivers in ancient cultures of Greece, Babylon, Egypt, and Asia. It was considered by Homer to be the "ocean stream," and other Greek myths portrayed these stars as the river that flowed from Aquarius. Eridanus is one of Ptomely's 48 original constellations. 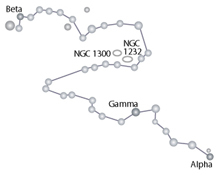 The most southern and brightest star of the constellation, Achernar, was added in the Renaissance times. The best known myth associated with Eridanus is the rise and fall of Phaeton, son of Helios the Sun god (Apollo). Helios's task as a god was to take the reins of a chariot lead by white horses and traverse the heavens above earth. Phaeton, encouraged by his sisters, restlessly begged his father for the opportunity to drive the chariot. Helios turned down Phaeton many times because he feared that his son was not strong enough to control the chariot. One day Helios gave in to his son's requests and let Phaeton take the reins. As Phaeton rose into the sky with the chariot, he drove the chariot erratically, nearly freezing and burning the Earth's surface. Zeus was not amused by Phaeton's adventure and struck him down with a bolt of lightning. Phaeton fell off the chariot and met his end as he tumbled into the sacred river Eridanus. 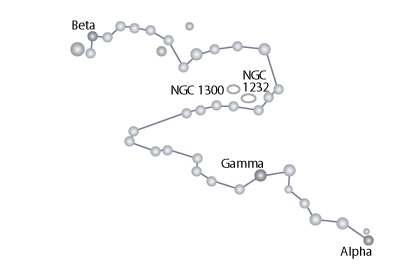 The ancient Greeks believed that the constellation represented the haphazard path Phaeton traveled.